Randal was commissioned by a real estate development firm to develop this architectural rendering of a residential design being offered in a development in Chicago’s near South Loop area. 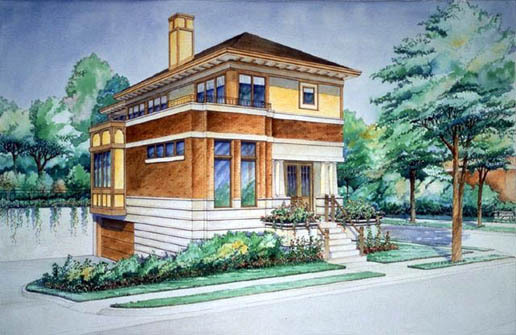 This was to be new construction offered in the Prairie School style, popularized by Frank Lloyd Wright. Randal first worked from architectural drawings to develop a 3D perspective wireframe. Once a view was established and approved by the client, Randal transferred the line work to watercolor illustration board, then rendered the house in watercolor and ink line work. The original was done on D’Arches 22 x 32 watercolor illustration board.